How to enrich your campaign with QR Code's? There are a couple of questions that need to be answered. Who is your target audience? If this audience is not likely to use their mobile phone, well then QR Code might not enhance your campaign. Where to place the QR Code? The QR Code itself is a tool make a link between the real world and the internet, on a webpage your better of to place a click-able link. Combined with the QR Code, give an indication what you audience will get when the code is scanned, giving a reason to scan the QR Code at all. When an URL is used in the QR Code, make sure your landing-page is mobile friendly. This is all theory, so here is the real live example. Note: I know that I just mentioned not to place the code on the internet, therefor by just clicking on the picture, will result in the same URL as the QR Code content. 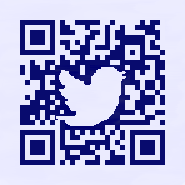 Get this Twitter QR Code with a link to your Twitter account for Free. Just scan the code for instructions. If you require a fast scanning, error free Custom QR Code, containing a graphic of your choice, don't hesitate to visit contact me or visit my site to see more examples of what is possible with QR Codes.